You will feel very much at home in our comfortable and natural site ! In a family friendly atmosphere, you will soon make friends and your children will have no difficulty in finding playmates. 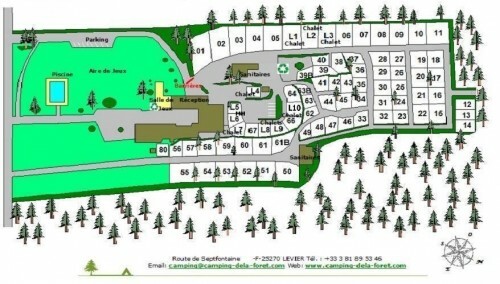 The playgrounds and swimming pool are located near the entrance of the campsite so that the peace of the camp site is maintained. From 1st July, we welcome you to our terrace to try our pizzas, chips, warm tarts, pick nick hampers, cool drinks, and local, and ice creams to eat there or take away.Every morning from 8am fresh bread and pastries are available without needing to reserveCoffee and breakfast is also availableWe can also cater for groups from breakfast to dinner. Need to access the internet ? Wi-fi access is also possible on the campsite. You can surf the ‘net from your deck chair ! Barbecue – fancy a bbq ? We have barbecues for hire for the day or week, or join us for a barbecue “franc comtois” be sure to book in advance ! We have a laundry on site with washing machine, drier, indoor and outdoor drying areas, iron and ironing board.